The Business Plan Financials for Excel provide an integrated set of templates for financial data to quickly produce accurate and high quality business plans with detailed financials. The business plan financials include standard accounting statements for recording actual data with automated projections, breakeven and sensitivity analysis conducted from specified assumptions. Input or link actual or baseline financial data into standard income statement, balance sheet and cash flow statement. Standard financial statements are projected automatically from the baseline data for the business plan financials. 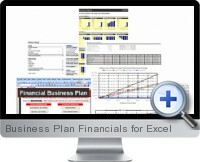 Detailing reporting of business plan financials includes breakeven analysis and sensitivity analysis with trend charting. A summary of the business plan financials is presented in a high quality dashboard report for presentation and publishing purposes. The financial reporting serves for both business planning requirements and the ongoing tracking of business trends and performance.